Appreciation: 10/10. Best combination of beaches and mountain views. Hong Kong Geopark at the beginning. Fishing villages at the end. Transportation: Take a taxi in Sai Kung, in front of the 7-11 and ask the driver to get you to High Island Reservoir (萬宜水庫; maan6 ji4 seoi2 fu3). Return to Sai Kung via bus 92 at Wong Chek pier, or bus 94 all the way to Diamond Hill on Sundays & public holidays. High Island Reservoir (萬宜水庫; maan6 ji4 seoi2 fu3). This is where the cab will drop you off. You can spend a bit of time going down to check-out the Hong Kong GeoPark's rock formations. When done, head left to the trail. 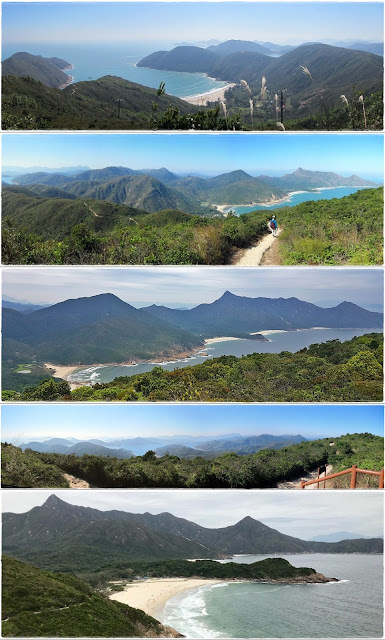 The path going up after Sai Wan is quite clearly demarcated. After 8km and 3.5 hours, you'll be about at this point, overlooking the wonderful Ham Tin beach! Exactly at trail marker M042 (encircled on the picture), you will see stairs on your right. Take them and follow the path to the Sha Tau pier. You can take a fast boat to Wong Shek pier where the bus terminus back to Sai Kung is.